Line 6, Inc. (line6.com), the industry leader in digital modeling technology for music-creation products, announced today that it has sold more than one million Spider® digital modeling guitar amplifiers worldwide. Spider guitar amps debuted in 1999 with six amp models, seven effects, 10 presets and the choice of 1x12, 2x10 or 2x12 speaker configurations. Today the Spider line has grown to include Spider Valve™ MkII (a family of tube amps co-designed with tube guru Reinhold Bogner), Spider Jam™ (a top-selling jam-along amp that features backing tracks performed by famous musicians) and Spider IV (an amp family full of #1-sellers). Spider IV guitar amplifiers have many unique aspects. One of which is access to huge collections of presets that were either dialed in by popular guitarists or inspired by them. Celebrated bands and artists including Slipknot, Coheed & Cambria, Johnny Marr and others handcrafted their own presets and saved them into most Spider IV amplifiers. Another is USB connectivity via Line 6 FBV™ MkII foot controllers. This connection allows the user to edit and organize their tones with Spider Edit software, and trade tones at CustomTone.com. 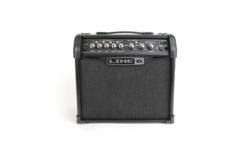 Line 6 continues to make guitar amplifiers that are as cutting edge today as the original Spider amplifier was in 1999, and looks forward to celebrating more milestones. *Based on MI SalesTrak® 2007 - 2010 reports. Shop PRODUCTS for LE$$ / Price list Click here!